In her new book Completing Our Streets: The Transition to Safe and Inclusive Transportation Networks, Barbara McCann notes that “the fundamental philosophy behind the complete streets movement can seem painfully obvious: roads should be safe for everyone traveling along them.” But as McCann, who served as the founding executive director of the National Complete Streets Coalition, also tells us, “the history, political standing, habits, and orientation of the transportation industry in the United States have made it extraordinarily difficult for any policy movement to shift the way transportation projects are planned and built.” Her book reflects on how the movement towards safer, more inclusive streets has started a positive movement in communities across America, as there are now more than 500 localities with complete streets policies. McCann describes the complete streets movement as essentially a policy initiative that seeks to change the way all roads are built in the United States. It developed from an effort by advocates who wanted to put a directive in federal law to include bicycle facilities in all road projects. This was challenging because driving and biking were considered separate modes of transportation supported by different systems. What emerged from this effort became a movement to radically reframe transportation infrastructure. The focus turned to broadening transportation safety to include all people traveling along a corridor. It also widened from the individual road corridor to a jurisdiction’s entire network. According to McCann, the movement’s success to date is not rooted in a simple definition of a new kind of street. There’s no one answer to the problem. She emphasizes that “defining the problem is not a design issue.” Lasting change only comes from addressing the primary problem, which is both political and cultural. The complete streets movement is succeeding not because it lays out a compelling design paradigm, but because it uses three key strategies to help change the way transportation projects are chosen, planned, and built. These three strategies are: shifting the focus from project design to values and policy; building a broad base of support for policy change; and creating a clear path to transform everyday practice. McCann attributes much of the complete streets movement’s success to the ability to “reframe the conversation about transportation in a simple and powerful way.” Complete streets have multiple benefits, such as improving the health, sustainability, and economic vitality of communities. But the movement’s most potent argument is that safety on streets is a problem that effects everyone, both drivers and non-drivers. One third of the population does not drive, including children, older adults, people with disabilities, and those without the financial resources to own a car. These individuals need safe and effective means of transportation via walking, biking, or public transit. Discussing safety is a highly subversive way to introduce new ideas. Introducing it as a topic immediately broadens the conversation around transportation development. The movement has also been able to “build a broad base of political support.” McCann says that all too often elected officials adopt new policies that stall out in implementation. A whole new effort is necessary to bring them into daily practice. Complete streets policy advocates like ASLA make explicit the values surrounding the effort and build strong coalitions to support cultural and institutional change. They focus on building a network of support that includes not only politicians but also practitioners within transportation profession who are already trying to change the system from within. They also work to build support in communities by clarifying policies and helping people to understand, affirm, and support new approaches. Complete streets initiatives then “provide a clear path to follow in transitioning to a multi-modal process.” To be actionable, the movement offers participants a map for building multimodal street networks that support driving as well as walking, biking, and public transit. Historically, transportation development since the the Federal Highway Act of 1956 has made a habit of building projects that are specific to a single method of travel. Complete streets initiatives provide a three-phase guide for action to break this habit. This guide provides technical information for building streets. More importantly, it includes information on writing and passing a policy commitment supported by the community, and outlines a process for changing the systems, culture, and practices inside transportation agencies. With this three-part strategy, McCann argues, the complete streets movement offers every community a viable framework for improving their street network. In 2012, a nationwide public opinion poll showed that 63 percent of Americans would like to address traffic congestion by improving public transportation and designing communities for easier walking and bicycling. Cities across America face different challenges to addressing these issues. Older cities generally have a structure more conducive to a transportation refit, whereas newer cities are dealing with hundreds of miles of mostly disconnected street networks. Many of the communities within newer cities are far from reaching a progressive development ideal. 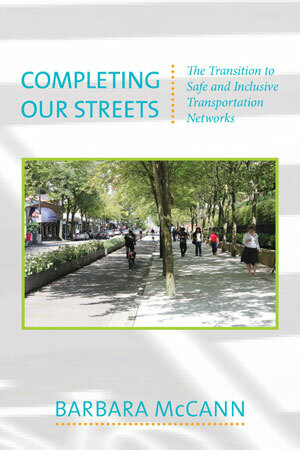 McCann’s book demonstrates how, regardless of the obstacles they face, communities of all kinds can begin to make lasting and effective changes using the principles of the complete streets movement.